1886, New York. Stock certificate for 10 shares. Brown. 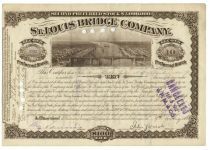 Vignette of panoramic view of the St. Louis Bridge. Punch and stamp cancelled. Very fine. Signed by WILLIAM TAUSSIG as secretary.